Being able to understand the different types of financial documents and information your business has should help you better understand your financial position. Learning how to decode a balance sheet will help give you the tools you need to make important decisions about your business. A balance sheet, or sometimes called a “statement of financial position” provides a snapshot of your company’s financial position on a given date. This statement gives you details of your assets, liabilities and equity – and is usually prepared at the end of a reporting period, such as a month, quarter or year. The balance sheet is based on the basic accounting equation: Assets (value of everything the business owns) = Liabilities + Owner’s Equity (How the business paid for the assets). Most statements report assets in the left and liabilities and equity detailed on the right. They should both be consistent with the equation – having the same dollar amount for each side. Assets are best described as anything your company owns that has some sort of monetary value. Your assets are concrete items, such as cash and inventory – as well as marketable securities. Different types of assets are listed on the balance sheet based on how quickly they can turn into cash if needed. Current Assets – Cash, inventory, accounts receivable, short-term investments and pre-paid expenses. Fixed Assets – Long-term assets such as property and equipment. Cannot be converted into cash for at least one year. Depreciation must be calculated. Other Assets – Intangibles, like patents or trademarks held (only if you know their fair market value). This is what your business owes, in order of how soon the payment is due. For example, liabilities reflect all the money that your business owes to others – including loans, wages and other debts. Just like assets, liabilities are also categories based on their due date in which you expect to pay them. 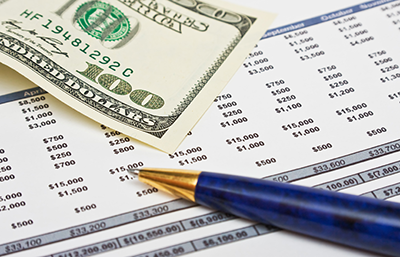 Current Liabilities – Accounts payable, accrued wages, taxes and interest due within a year. Long-Term Liabilities – Mortgages, bank loans and anything due in more than a year. Sometimes called net worth or net assets, represents the assets that remain after you deduct what you owe. Valuing a business can be extremely complex – the owners’ equity doesn’t always represent the current market value of your business. Depending on the legal structure of your business, such as if you’re a sole proprietor, in a partnership or have stockholders, can also reflect on your owners’ equity. Owner’s Equity – The money you have left over after selling everything in the company and paying off liabilities. Assets and liabilities should “balance” out. Typically, balance sheets include previous data for comparison. Calculating the basic financial ratios can track the performance of your business, identify trends and help implement the strategies of your business. Data from other balance sheets compared with current ones can help guide you to an even more in-depth understanding of your business’ finances. Of course, I am here to help guide you through these complex statements and help manage your business finances for the future.